Our 2018 Chevrolet Trax is a subcompact crossover SUV equipped in LT trim. Our Traxs exterior features sharp looks, roof rails overhead and 16 aluminum wheels beneath. Powering all four wheels is GMs 1.4 liter Ecotec four cylinder. Featuring variable valve timing and a turbocharger, it puts out 138 horsepower and 148 ft. lbs of torque. This motor is mounted to a crisp shifting six speed automatic. Inside, our Trax has a comfortable cloth interior that seats five. This vehicle is equipped with power windows, mirrors and locks, as well as a drivers seat with power functions. The rear features a rigid cargo cover, and rear seats fold flat for maximum storage space. Up front, the steering wheel is equipped with controls for audio, voice commands, hands free calling and cruise control. The center touchscreen features Chevrolets MyLink audio system, which includes USB and auxiliary ports, SiriusXM satellite radio capability, Bluetooth audio and phone pairing, as well as Android Auto and Apple CarPlay. Other features include remote start and OnStars vital services. ***This vehicle qualifies for our Certified Pre-Owned Program. It includes a 150+ point inspection, a 3 month/5,000km warranty or the balance of the manufacturers warranty, a one-time 30-day or 2,500km exchange privilege, and 24-hour Roadside Assistance. 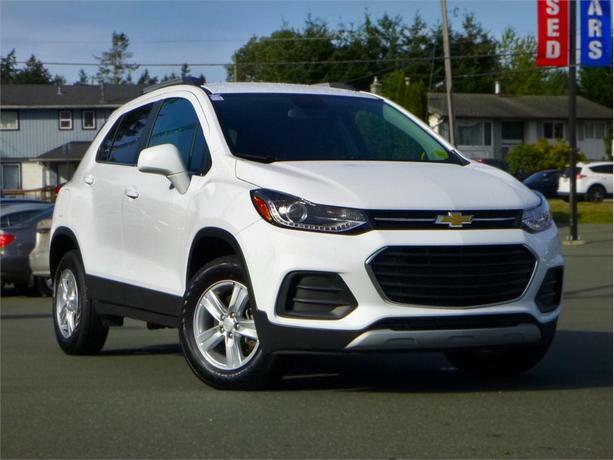 This Program includes all makes and models, it is the #1 Pre-Owned Vehicle Program in Canada*** ***For Sale at our Brian McLean Chevrolet Buick GMC store located in Courtenay, BC. Please contact us for finance/purchase options and further details. Trade-ins welcome. ** Serving communities on Vancouver Island for over 25 years, Nanaimo, Parksville, Qualicum, Duncan, Victoria as well as many customers on the mainland from Vancouver and as far as Kelowna. Ask about our travel assistance for out of town buyers!! !